It is tradition to declare a James Bond Opening Day a National Holiday and go to the movies! 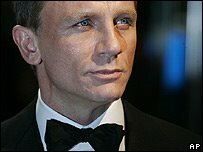 We will be seeing Casino Royale in Long Beach at The Neptune Theater. I am packing martinis and treats.